Finally finished the first 11 chaps for my Blood Bowl Chaos team, with the addition of another four beastmen. 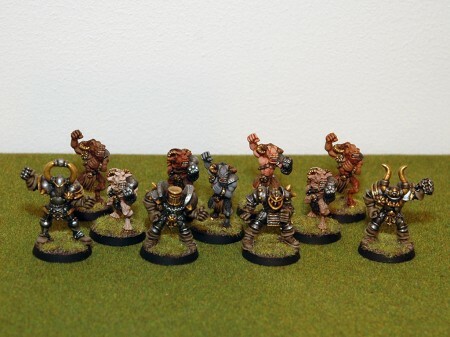 Once again, I did the skin and fur in unique shades and I’m hoping to have all 11 beastmen in slightly different tones when the whole team is done. While the models are rather dull, they paint up easily. This brings my painted total for 2013 up to an astounding… 11! Yes. I’m definitely behind on my plan to paint one model a week. Need to do more painting and posting to bring the total up! Beastmen. Yup… Still struggling with the focus, sorry about the fuzzy photo. Here’s the whole gang, as they are now. I realized after taking the photos that I had forgotten to paint the numbers on the shoulder pads of the four new additions. Still haven’t figured out how to get proper depth of focus on my camera while also getting the light sensitivity and exposure I’d like. 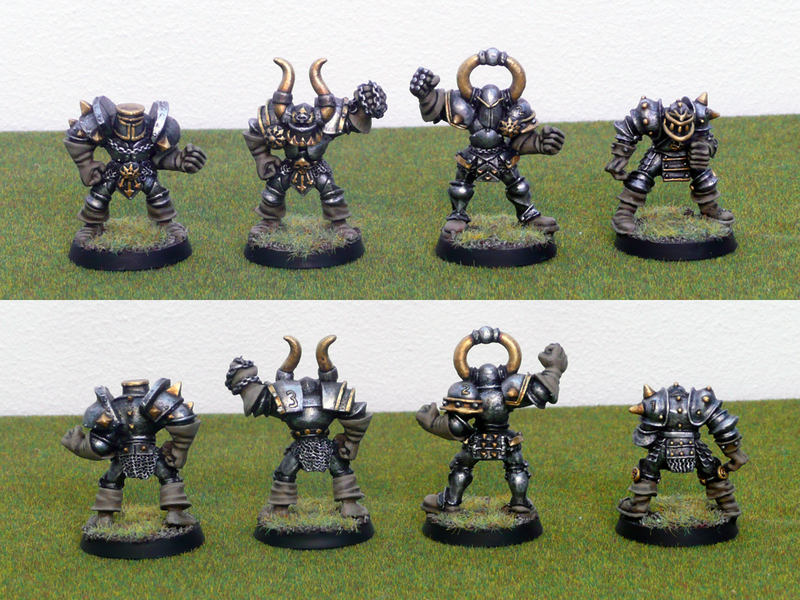 Hence the slightly out of focus Chaos Warriors. I’m sure you’ll manage though. 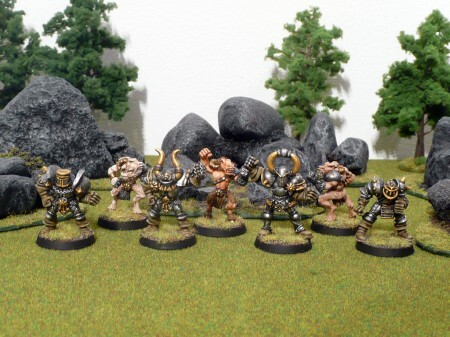 I have also been working (a little) on the Harboth’s Black Mountain Boys that I’m doing for the end of July painting challenge over at the Oldhammer forums. Base coat of flesh done on them all. Quite some way to go yet, but the troopers should be rather quick affairs. Nice models though. Too bad my champion is so poorly cast that it can not possibly be a legit cast. I did pay £10-£15 for him so it smarts a bit. Didn’t look too closely upon reception and now a few years later it’s not really time to open a case with eBay. Oh well, I’ll paint him up! Cell phone photo, pardon the craptitude of it! Things have not been going my way hobby wise this year so far. For instance I have not posted a single newly painted miniature all year. In addition, it was over a month since my last post here. To remedy this, here’s almost half a Blood Bowl team. I’ll give more details on them once I’ve got the full team done. They are bog standard 3rd edition Chaos models (sculpted by Gary Morley around 1992) apart from an added chaos warrior (Wormhowl Greyscar, sculpted by Mark Copplestone in 1988 or so) from the days of 2nd edition. The inspiration for the team colours came from Harry’s take on them as can be seen here. I wanted something that would be quick to slap on and still look good. I decided to go with gold “bone” details, so the horns of both chaos warriors and beastmen are golden – as are the hooves of the beast men. On the beastmen I tried out three different takes on skin. From left to right, they are VGC Pale Flesh washed with Gryphonne Sepia, GW Dwarf Flesh washed with Ogryn Flesh and finally GW Tallarn Flesh washed with Ogryn Flesh. I’ll try a few more variants to get a varied squad. The biggest revelation I got when doing these up is that Gary Morley has a nice sense of humour or made a bit of a freudian slip when sculpting the beastmen. 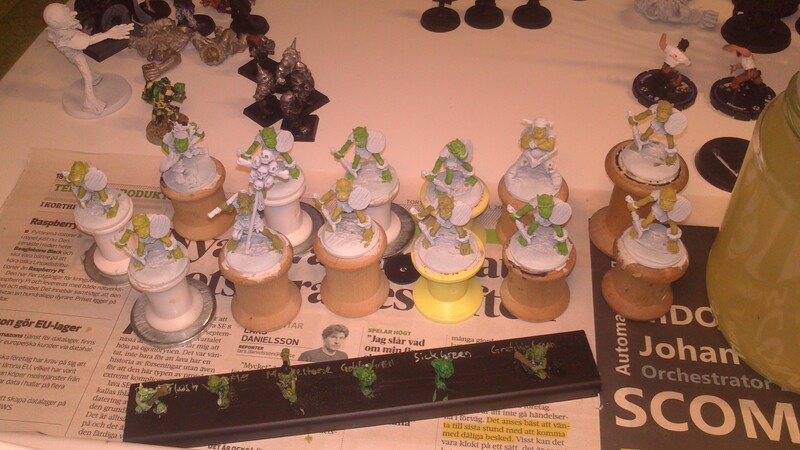 These bring my painted total for 2013 up to… 7. I won’t say how much I’ve bought this year – but considering Mega Miniatures are closing let’s just say I’m filling my cabinets with delicious old Metal Magic models before they’re spread in the wind. For some Conany reason I also did a little stocking up on barbarians from Forlorn Hope. Great value and service as always! A while ago I came across this thread on Warseer where a guy was doing Dungeon Bowl teams based on the example teams on the box bottom of the old expansion for 2nd edition Blood Bowl. 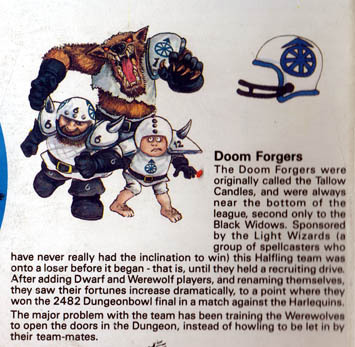 I have fond memories of Dungeon Bowl, that and Blood Bowl were the games that really pulled me into the miniatures gaming hobby (and kept me around, too). 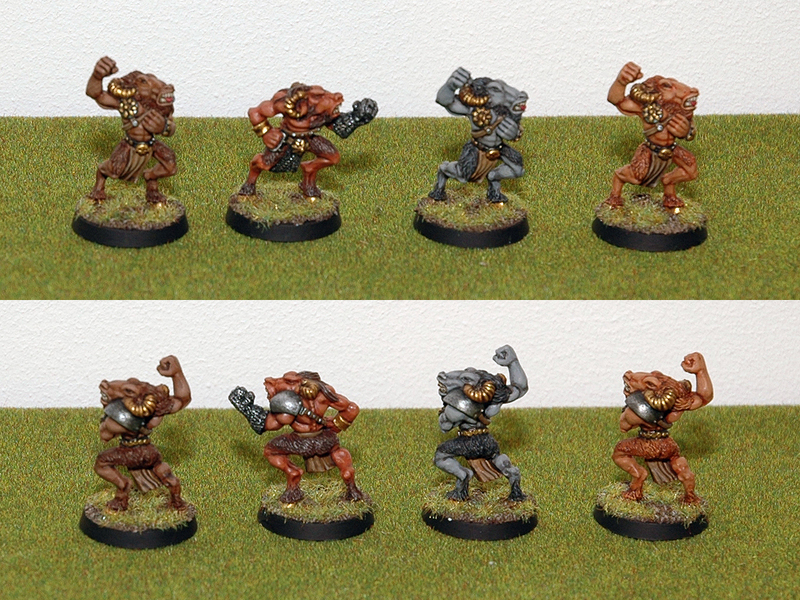 I also miss my old collection of 2nd edition Blood Bowl models, so I decided to re-collect them and create several (hopefully all) Dungeon Bowl teams to be used for pick-up-and-play games. I’m pretty much done collecting the miniatures; now I have to paint, paint and paint. I also need to do some conversions (I’m using 80s mummies and ghouls for the Black Widows team) and ofcourse do the dungeon floor pieces (using Dave King’s free Bederken Dungeon Tiles). The first team I’ve started painting are the Doom Forgers. 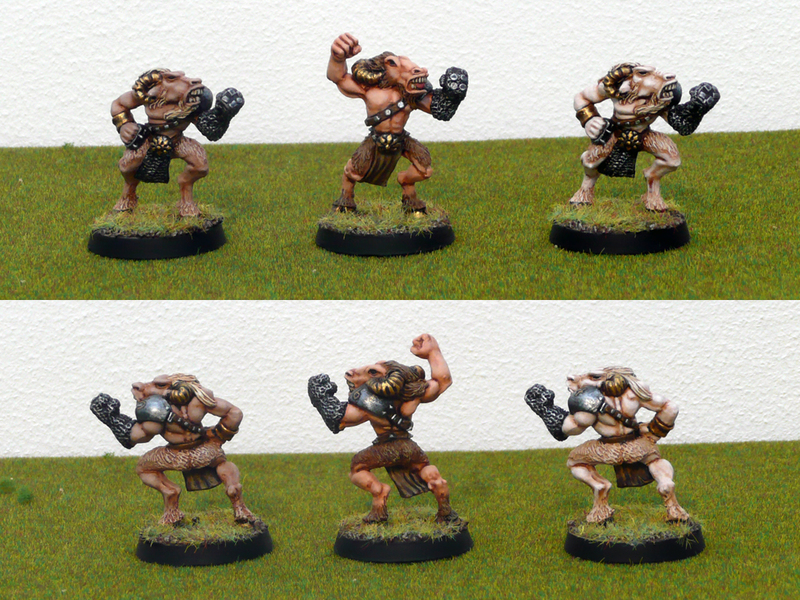 Here are the first five guys from the team painted up. I’m doing numbers and postional colours when I have the full team painted up. 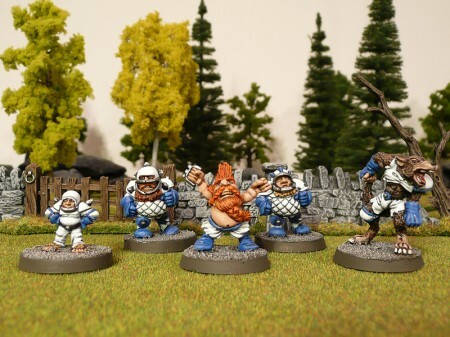 From left to right we have a halfling, a dwarf blocker, a troll slayer (which is actually a Marauder slayer with the weapons removed and a simple knuckle duster sculpted on), another dwarf blocker and finally a werewolf represented by the old Willhelm Chaney star player model. I entered these in the second round of LPL6 at LAF. I didn’t win, but managed to score a draw. I think my entry would’ve done better if it hadn’t been for the clash between models, bases and environment. 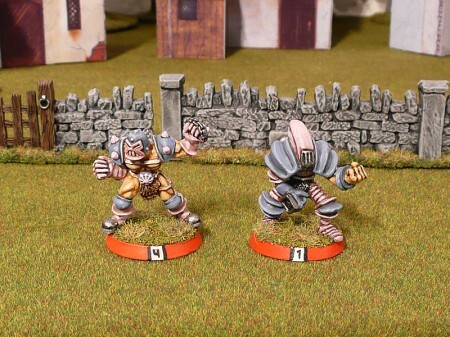 The models are clearly Blood Bowl miniatures, but they are mixed in an unconventional way. Furthermore, they have bland bases with no grass on them. Blood Bowl miniatures usually have grassy bases but since these are for Dungeon Bowl I figured grass bases would look out of place. However, I don’t have a dungeon environment to photograph the models in so the bases clash with the surface they’re on. Finally, I’ve just used my regular wargaming terrain which doesn’t really fit with the models. Oh well, I’m entering these in a future round again – together with the other six models making up the starting 11. I’ll try to do something more dungeon like for that. I’ve got the old 2nd edition styrofoam playing field, a quick paintjob on that could work. This week I have mostly been getting… a minstrel! 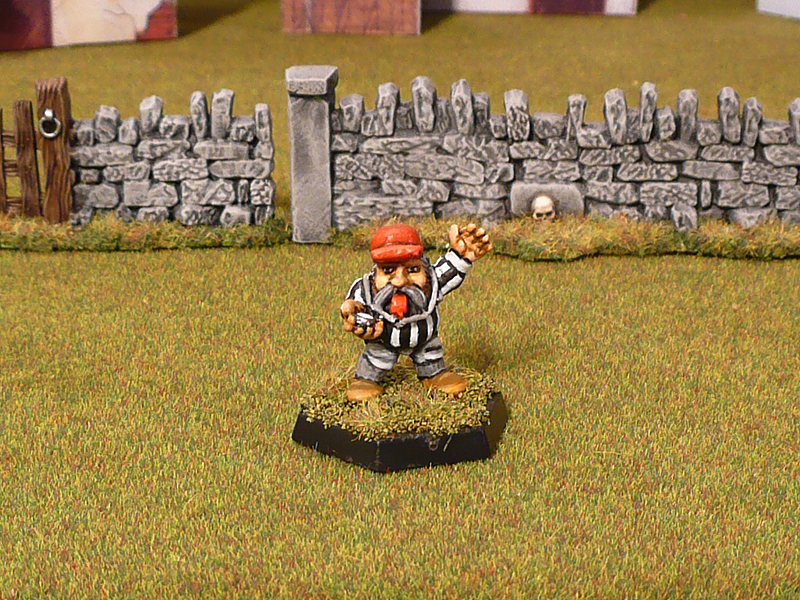 This week I only got one miniature; the minstrel from the old Talisman range of models. Didn’t bother photographing it, as that seemed a bit much (or little, depending on your perspective on it and life in general). Instead, I’ve got some random old Blood Bowl models I painted up years ago. 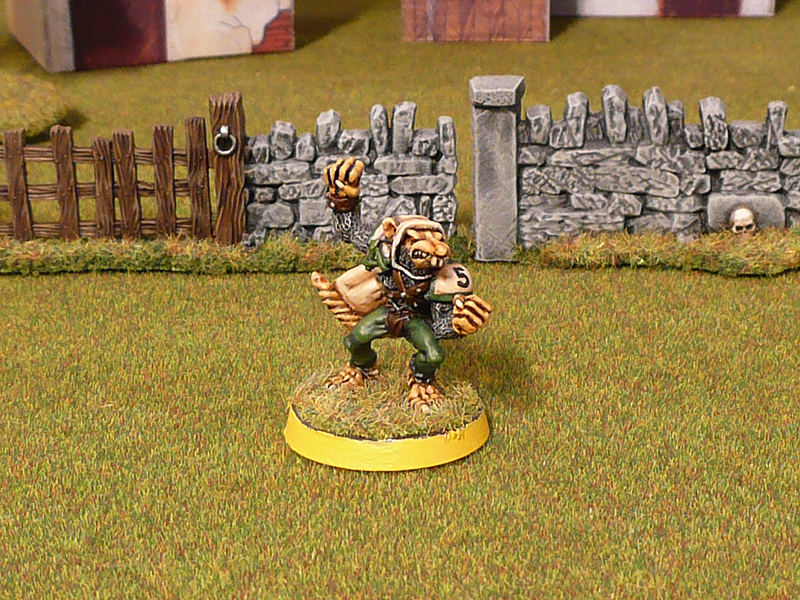 First out, a third edition skaven gutter runner. I did this in the early 2000s, as a test for the team colour scheme. Still pretty content with how he looks. The bright yellow base ring is a remnant from my 2nd edition days where player positions were indicated by base colour. Yellow is for catchers. Most modern day players hate colour coded bases. I still like it, but will do the colour coding less blatant on my future Blood Bowl players. I have no more models from the 3rd edition skaven team (sold them off in my mid 2000s lead purge), so he’ll languish in solitude forever. Next, some pretty special models. The left one is a regular issue 2nd edition Chaos Player #2. To the right is one of Tom Anders’ Chaos Cup specials, which were resculpts and/or recasts (in the most legit sense of the word) of the Chaos All Stars team Phil Lewis did back in the days. I’m using these both as blitzers in a “counts as” human team. 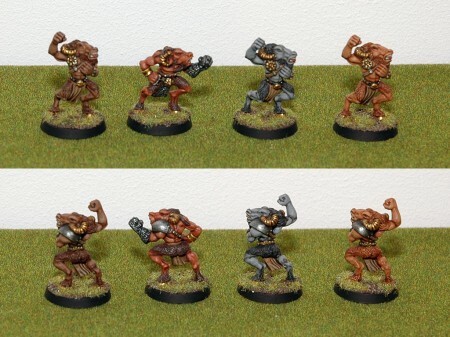 I’ve got all the Chaos Cup figs as well as some nice 2nd edition chaos and human models. I’ll have to rebase these, but will try to stick to the paint scheme for the rest of the team. Hopefully I’ll be able to do them “soon”. Finally, a little off-pitch token for those Get The Ref results! A 2nd edition dwarf referee. In 2nd edition Blood Bowl, there were actually rules for an on-pitch referee moving at random and requiring line of sight to spot fouls and other tomfoolery. That went out the window with lots of other cool stuff when the much improved (but less flavourful) 3rd edition was released. I never use this model for anything, but I do quite like it. Painted sometime around 2006 or so. That’s it for this time. The LPL is proceeding as planned, though I’m losing the current round (with only a few votes!). I’ve had a rough time painting recently so not much work done. Still plugging away on the team for round 5. Will have to do a replacement team for round 4, it seems. The current lead tally is 27 painted – 109 acquired = -82.